HILL CLIMB AND SPRINT - HOW TO GET STARTED IN HILLCLIMBING & SPRINTING! 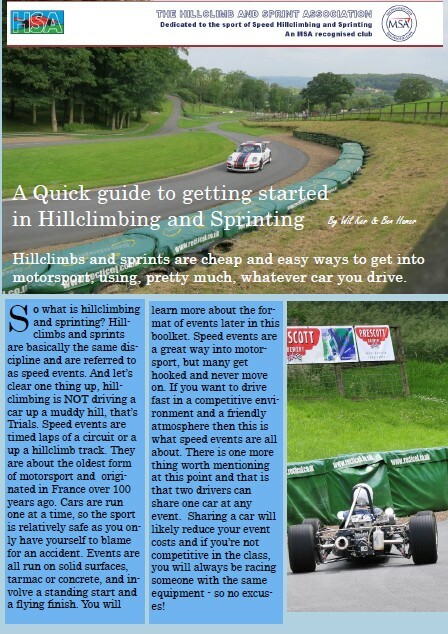 The HSA have published a handy guide (updated for 2017) to getting started in Hillcliming and Sprinting by competitors Wil Ker and Ben Hamer who have had extensive competition experience with a turbocharged and modified Minis and more recently an OMS single seater. Ben also sits on the Motorsport UK's Sprint and HillClimb sub committee and together, they have an excellent working knowledge of the sport. You can download a pdf version of their guide here. The following sections will guide you through all the basic steps required in order to go hillclimbing and sprinting. They are not in any order of preference or importance and all will require further reading and experience, before you fully get to grips with what the sport is all about. Hopefully by reading this guide you will gain enough knowledge to get you on the road to your first event. It is important to state at the outset that the definitive guide to rules and regulations are set out in the Motorsport UK (MUK) 'Blue Book'. You will receive a copy of this book when you get your competition licence. In addition organisers of Championships and the Events themselves publish supplementary regulations, which must also be followed before being able to take to the track. Speed events allow a large variety of cars to compete, ranging from production cars (with varying levels of modifications) and all types of kit cars through to single seaters (which can range from Formula fords and motorbike engined types to �100,000+ 600bhp monsters). Few types of cars are excluded from speed events. As a beginner with no racing experience and a �B� Class licence (see how to get a licence in the licence section) you will be able to drive all types of production and kit cars but will be limited to 2.0 litre engine capacity (or 1428cc forced induction) in single seater and sports libre (unless running as a roadgoing car) classes for cars built after 31/12/60. If you are entering a roadgoing class then the car must have a valid MOT, road tax disk and insurance. And if your car is built in quantities of less then 1000 peryear then it will require a roll cage. The popular motor sports retailers such as Demon Tweeks, GPR and Merlin Motorsport all sell sticker sheets and race numbers. If you want to modify a car or build a non-roadgoing car then the regulations get a lot more complicated. The regulations are all in the �Blue Book� but speaking to other competitors is a great way to get the information you need. The HSA has members competing in most classes and someone should be able to help you. So either come along to an event and have a chat or get on the HSA Facebook Group and ask some questions. If you want to buy a car already modified for Hillclimbing then you should ensure that any non-roadgoing car has an MUK logbook/vehicle passport. Logbook/vehicle passports are essential for non-roadgoing competing cars, although they are easy to obtain, buying a car with one gives some security that it meets the specific regulations. The minimum you require is a helmet, fireproof overalls and a pair of fireproof gloves; all these items must meet the required specifications as laid out in the MUK Yearbook for the current year. In non-roadgoing cars, racing cars and sports libre cars you will also need a FHR (Frontal Head Restraint, often referred to as HANS) and a suitable helmet with HANS posts. Additionally you can buy fireproof underwear, balaclavas, racing boots and gloves; these are not necessary but it�s all added safety. Safety equipment has to comply with specific BS standards. These are listed in the �Blue Book� but anyone selling such equipment should be able to help you out. Note that helmets don't remain valid forever and only helmets to SNELL 2010 and 2015 standards were accepted in 2017 competition. All UK race licences are issued by the MUK (MUK Licence). As a beginner you will need a "non-race National B" licence; this currently costs �45. In most instances you will require no medical, just your doctor�s name and address and then a passport photo of yourself. The license last for 1 year from January 1st to December 31st, so don�t apply for you license at the end of the year. Every licence is issued with a copy of the MUK Yearbook more commonly referred to as the �blue book�. Once you start competing, you can get your licence upgraded by getting it signed at events to say that you competed in a safe and satisfactory manner. Why do I Need to Join a Car Club and why the HSA is Ideal? To gain entry to events you will need to be �invited�. This basically means that events are only open to members of clubs or specific championship competitors. Who is invited to an event is listed in the supplementary regulations issued with entry forms by the organising club. Obviously not all events are open to all clubs and championships. The HSA as a national club is invited to many speed events throughout the year and throughout the country. The SBD HSA Speed Championship visits many of the best Hillclimb venues in the country and is an ideal way to get invited to enter such events. Assuming that you now are a member of an invited club to your chosen event, you have a licence, some safety gear and an eligible car then you are ready to enter. First you need to get an entry form. If you have entered a championship then you will be sent all the entry forms you need automatically for every championship event. If not then you will have to contact the relevant events secretary of the organising club. A good place to start is here. Once you have the form it should be a simple task to fill it in and send it off with the appropriate entry fee. There are a number of things to watch out for. All events have opening and closing dates for entries, also as some of the most popular events get over subscribed you are not guaranteed an entry. It is good advice to send off entry forms as early possible as most clubs have a first come first served policy, especially early in the season. Later in the season you are more likely to gain entry to an event if you are in the fight for the championship or class win. Speed events are unique in that two people can share a car at one event. This an ideal way to start competing as lots of costs are shared and although you might not be the fastest in your class at least you can be faster (or slower) than your shared drive. As far as entry to events goes, both drivers will be required to fill in a form and indicate that it is a shared drive, naming the other driver. When the gates are open, important if you are arriving the evening before the event. Most importantly who you will be competing against. Signing-on: You need to take yourself, your licence and any club and championship ID cards to the signing on office. Every event seems to have a different method for how this works, but all are generally explained in the joining instructions. Scrutineering: Your car and personal safety kit will need to be inspected by an MUK scutineer. These generally come to you and are not to be feared, over the years I�ve been pulled up on many minor items, but never been stopped from competing. Drivers briefing before each event all the drivers will be called to a meeting where the Clarke of the course will explain how the day is to be run and what is expected of everybody. Make sure you attend these, especially if you are a new driver. Walking the course: It is encouraged for first timers to walk the course, however, you will find that even the most seasoned competitors will walk the course in the morning. Once all this is completed you�re ready to race. You will be called by race number to the start line (or invariably the start line queue). When it is your turn you will need to drive to the start line where the marshals will line your beam splitter up with the starting beam. Then you just have to wait for the green light and off you go. A point of note is that the green light does not indicate that the timing has started, merely that the course is clear for you to go. You can therefore take your time and go when you are ready, don�t take to long though marshals can get impatient! As a member of the HSA you will have access to the knowledge of experienced hillclimbers and sprinters, or you could email me, Wil Ker.